Applying concrete cure & seal. When concrete is born-when you place fresh concrete where you want it to live out its life-it's like a baby: very sensitive and easily ruined. If you take good care of it, when it's young it will grow up to be a strong and reliable adult; neglect it, and you'll be sorry! Curing is all of the things that we do to keep our concrete baby happy during the first week or so of its life: maintain the proper temperature (neither too hot nor too cold) and dampness (I know, most babies prefer to be dry-concrete likes being difficult). Curing is easy to skip in the instant but that will have a major impact on the quality of your finished work. While curing is important for all concrete, the problems that arise from not curing are most obvious with horizontal surfaces. 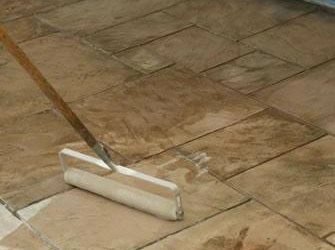 An uncured slab, whether decorative or plain gray, is likely to develop a pattern of fine cracks (called crazing) and once it's in use the surface will have low strength that can result in a dusting surface that has little resistance to abrasion. What is Curing and What Does it do to the Concrete? When is the Right Time to Cure Concrete? 1300-Clear Curing Compound Wax based curing compound. Great for interior and exterior. V-Seal 101 Seal & Cure Excellent moisture retention. Leaves no topical residue. Water-based Curing Compound VOC-Compliant. Easily applied with spray equipment. Industra-Seal 117A Protects and fortifies concrete against moisture damage. Acrylic Cure and Seal Ready to apply clear sealing compound. Non-yellowing.